We are big potato eaters at our house. I love the combination of eggs, potatoes and bacon. So a great way to serve this combination is right in the potato skins. Yes, it may take a little bit more time to prepare, but the combination served this way is worth the effort. We made these over the weekend, for a late brunch. 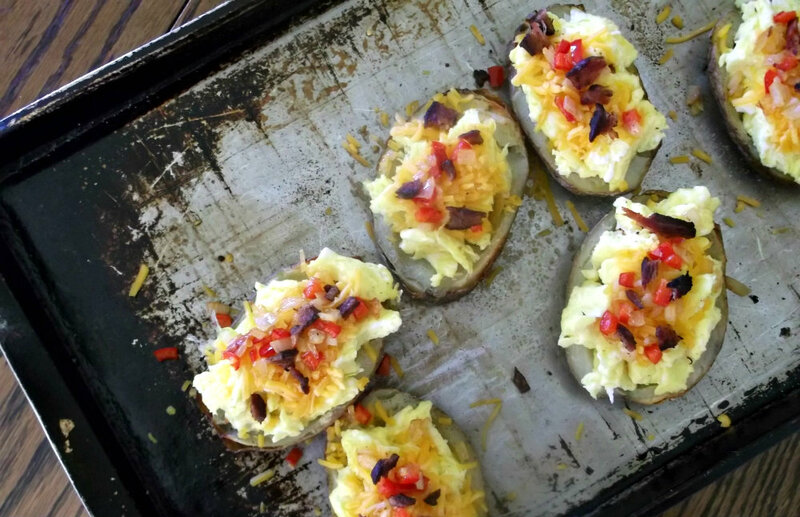 Mike loved them; he loves potato skins, so this was right up his alley. 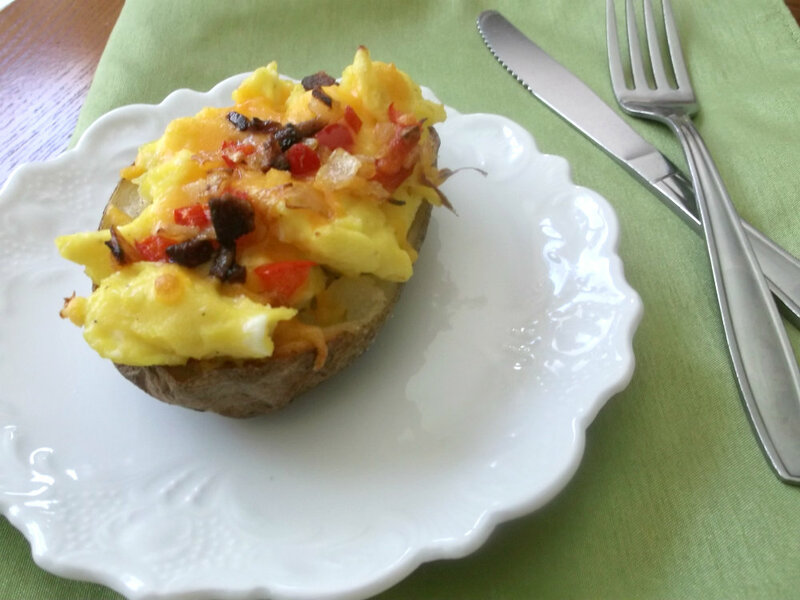 As for me I am not as big a fan of potato skins, but I have to admit that I really loved these for brunch. I know that we will be making these again. Next time we will try some different flavors, maybe some ham or breakfast sausage. browns as a side dish. So it truly was a win win all the way around. Take potatoes that have been baked or micro waved and scoop out the potato leaving a little of the potato behind. Spray the potato with oil and season with salt and pepper, place on a baking sheet. Place in a preheated oven and bake for about 10 minutes, until the edges of the potatoes start turning a golden brown. While the potatoes are in the oven spray a small skillet with non stick spray; add the onion and pepper and cook over medium heat until tender, about 3 to 5 minutes. Fry bacon until crisp once completed crumble. Beat eggs with milk season with salt and pepper; add to a skillet that has been sprayed with a non stick spray. Cook eggs over medium heat stirring often. Once the eggs, bacon, onions, and peppers are done. Take the potatoes that have been crisped up, taking half the onions, peppers, bacon sprinkle over the bottom of each potato. Fill each potato with the prepared eggs. Top the eggs with the remaining onion, peppers, and bacon. Finally top the filled potatoes with the cheddar cheese. Place the potatoes back in the oven for about 5 minutes until the cheese is melted. Serve and enjoy. I like this idea. I’ll have to convince myself to eat potatoe for breakfast, as we have it for dinner in Poland. Great idea. I love potatoes too. This is such a great & tasty breakfast idea. I’ll eat any kind of potato! 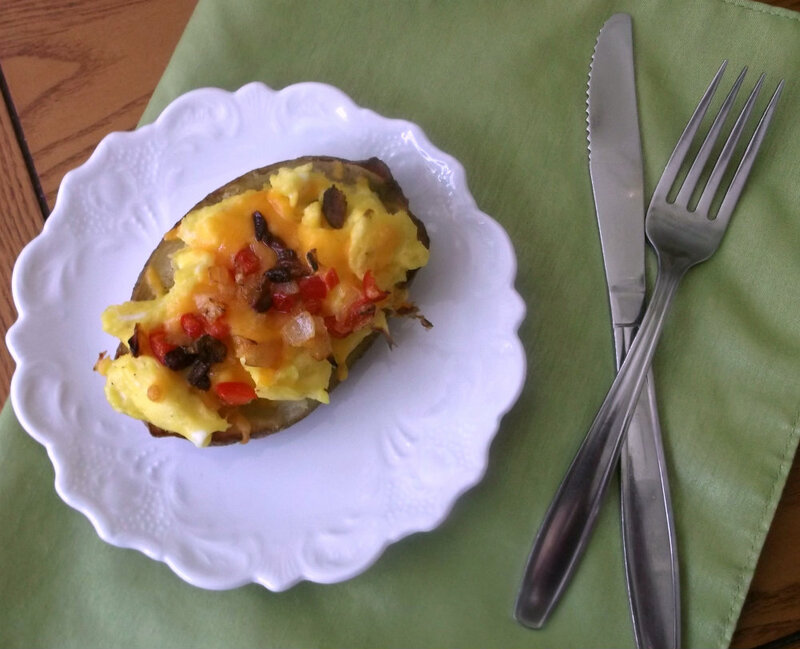 Love the idea of breakfast potato skins – I haven’t seen that before. Although I’m not a huge potato skin fan, I certainly do enjoy them from time to time. Definitely need to try this – thanks.